The SS Volendam was a steamer of the (Dutch) Holland America Line. It was built in 1922 by Harland and Wolff of Glasgow, Scotland, and weighed 15,434 tons gross. The ship was 575 feet long (175 m) with a beam of 67.3 feet (20.5 m). The ship had two funnels and two masts, and four steam turbines drove two screws, giving her a speed of 15 knots (28 km/h). It was named after the small Dutch town of Volendam in North Holland. The ship made its maiden voyage on 4 November 1922, sailing from Rotterdam to New York. The Volendam escaped to Britain before the Netherlands was overrun by the Germans in May 1940, and was assigned to the Children's Overseas Reception Board, a British Government operation that evacuated British school children overseas. On 30 August 1940 the ship was hit by two torpedoes fired by a German submarine. All but one of the passengers were rescued. The ship was converted to a troop transport ship and returned to service in July 1941, carrying over 100,000 troops by the end of the war in 1945. Following World War II, the Volendam was used to carry both troops and passengers. The ship made her last voyage, Rotterdam-Quebec-Rotterdam, in October 1951 and was scrapped in 1952. 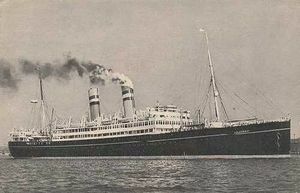 The Volendam was used for the transport of Mennonite refugees, and is particularly known for its transport of Mennonites from Europe to Buenos Aires in 1947 (known as the Berlin Escape). C. F. Klassen, then the Mennonite Central Committee representative in Europe, who organized the journey, chartered the ship. Some 650 Men­nonite refugees embarked at Rotterdam, Nether­lands, on 28 January 1947; in Bremerhaven some 450 others from a refugee camp at Gronau, Germany, joined them. Then they waited for a large group from Berlin. Because Klassen gave a financial guar­antee to the Holland-America Line for a possible delay in sailing and this warrant was accepted without the usual bail, the ship waited for the Berlin group. This was a group of some 1,100 Mennonite refugees from Russia who after much trouble and danger of life had reached Berlin and even in Berlin had a narrow escape, for only at the last moment did the Russian authorities give the neces­sary permission to travel through the Eastern Zone of Germany, occupied by the Russians. Packed into railway freight cars they were transported to Bremerhaven, from where the Volendam sailed on 1 February 1947, with the 2,306 Mennonites. The emi­grants were led by Peter and Elfrieda Dyck, who had come with the Berlin group. During the train journey a woman died, and a baby during embarkation. Two aged persons and a baby died at sea, and four children were born on the boat: one was named Peter Volendam (after Peter Dyck and the ship), and one Elfrieda (after Mrs. Dyck). Upon arrival at Buenos Aires further transportation was difficult, and for a large number of these immigrants impossible until October 1948, because a revolution had broken out in Paraguay. About 1,200 of the passengers of the Volendam settled in Eastern Para­guay, giving to their new colony the name of Vo­lendam after the ship which had brought them to the new world and to liberty. Of the remaining 1,100, 870 founded the Neuland Colony in the Paraguayan Chaco, 162 remained in Buenos Aires, and the rest joined their relatives in the Fernheim or Friesland colonies or settled in Asuncion, the capital of Paraguay. A second Mennonite transport of the Volendam was that in 1947 of 1,640 (including 635 infants) Old Colonists from Quebec to Buenos Aires, who were also to settle in Paraguay, and a third transport by the Volendam was in October 1948, that of a group of 751 West Prussian and Galician Mennonites (the Danzig Refugees) for Montevideo, Uruguay, and a num­ber of Mennonites from Russia, who intended to go to Paraguay, and who disembarked in Buenos Aires. The International Refugee Organization paid about $160,000 for the cost of the first chartering of the Volendam and assumed the full cost of the third transport as far as Asuncion. Thus the name of the Volendam is well known in Mennonite history. Fretz, J. W. Pilgrims in Paraguay: The Story of the Mennonite Colonization in Paraguay. Scottdale: Herald Press, 1953: 39-41. "Peter Dyck's Story." Mennonite Life III (1948): No. 1, 8-11. Reimer, Gustav E. "Von Danzig nach Uruguay." Mennonite Life IV (1949): No. 3, 12-14. Bos, C. A. W. "Volendam." Global Anabaptist Mennonite Encyclopedia Online. 1959. Web. 19 Apr 2019. http://gameo.org/index.php?title=Volendam&oldid=127773. Bos, C. A. W. (1959). Volendam. Global Anabaptist Mennonite Encyclopedia Online. Retrieved 19 April 2019, from http://gameo.org/index.php?title=Volendam&oldid=127773. Adapted by permission of Herald Press, Harrisonburg, Virginia, from Mennonite Encyclopedia, Vol. 4, pp. 842-843. All rights reserved. This page was last modified on 29 November 2014, at 00:59.